Several weeks ago a problem showed up with one of my 40/80 meter inverted vee antenna. 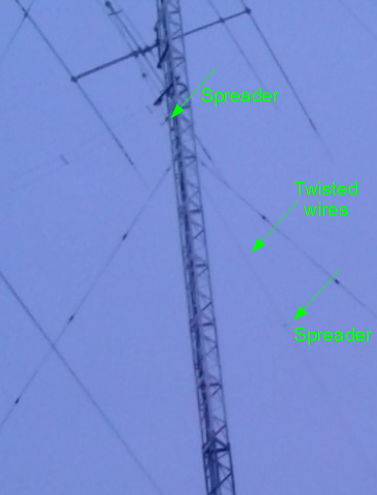 I first noticed it when the SWR on 40 meters was unusually high. At first I assumed it was due to weather since moisture or ice on the wires will affect resonance, and we get lots of both in the winter. I let the rig's ATU calibrate to the new impedance and continued operating, expecting the impedance to return to normal later. When the problem persisted after two days of fair weather I decided to look into it. Or, if you like, I looked up at it. What had happened was immediately evident. On one leg of the vee the wires for the 40 and 80 meter antennas twisted. A closer inspection with binoculars revealed that the twist was comprised of 3 or 4 rotations. The picture is annotated due to the poor resolution; I had no intention of climbing up there for a better view. In an article last fall I explained how this was to be a temporary antenna until I could put up permanent antennas for 80 meters and a lower one for 40 meters. I built it very quickly, using existing 80 meter and 40 meter inverted vees from my my stockpile, tying them together and constructing a set of spacers made from small PVC pipe (3 per leg). Small ropes extend from the bottom spacers, positioned at the ends of the 40 meter wires to the ends of the 80 meter wires. As I said, it's very simple. Unfortunately I made a bad decision on the ropes used to tie the antenna to anchors on the ground. I went with expediency rather than good sense since I was so pressed for time. 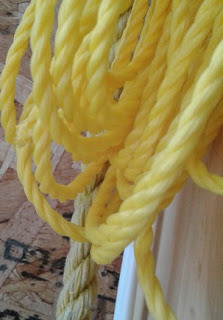 I had hundreds of feet of ¼" polypropylene twist rope for which I had no other use. It has been in storage for many years. Why I originally bought it I no longer recall. I cut 75' lengths and completed the antenna. Since twist rope of this type develops a torque when put under tension we had quite a job preventing the antenna from twisting when first installing it. When it seemed stable I let it be and hoped for the best. But hope is a 4-letter word. After a late January day with strong winds the twist reappeared in one leg of the vee. The twist is approximately 3 meters from the feed point, between the top and middle spacers. The middle spacer is ~5 meters along the antenna, near the middle of the 40 meter wire. Although an inconvenience, and not a disaster, the result of this accidental experiment is instructive and merits a brief article. It is worth thinking about should you ever run into a similar problem with one of your antennas. So let me step back and describe where I started. As with any fan antenna of this type the elements for the lowest frequency are almost totally unaffected by those for the higher bands. It is the higher bands that see the impact. The reason is that the ends of a dipole are most susceptible to capactive coupling to adjacent elements; that is why capacity hats must be placed far along an element to be effective. For this antenna the susceptible band is 40 meters. The resonant frequency on 80 meters was not noticably affected by the fan arrangement. In contrast the 40 meters resonance moved well below the band due to that coupling by increasing the antenna's electrical length. I knew this would happen and that there would be no time to tune the antenna after raising it. The difficulty is overcome by use of the rig's ATU. However there is some challenge when switching between the inverted vee and XM240 on 40 meters since the SWR curves are so different. For operational simplicity I currently reserve the ATU for the inverted vee and disable the ATU when switching to the yagi. It's an acceptable inconvenience for the short time the inverted vee is expected to be in use. When the elements twisted together the impedance impact showed up on 40 but not 80 meters. Some change on 80 must have occurred though not enough to require reprogramming the ATU. Interestingly the 40 meter resonant frequency didn't move far. Perhaps that's because the end of the 40 meter element is still properly separated from the 80 meter element. Instead the negative impact is a substantial decrease in the SWR bandwidth. The resonant frequency moved downward at least 75 kHz and the 2:1 SWR bandwidth decreased to ~150 kHz. 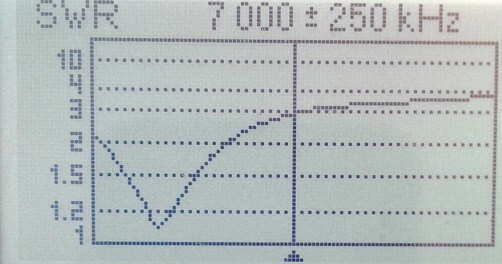 When undamaged the SWR at 7.0 MHz was ~2 and ~2.5 at 7.1 MHz. I have done no further investigation to determine why the impedance changed in this particular fashion since it is of limited interest to me. In any case modelling the twisted elements is almost certainly beyond the capabilities of NEC2. While not an ideal situation it does not hobble its performance. Single element antennas can survive a lot of abuse since even drastic impedance swings due to rain, ice, tangling and environmental coupling do not affect the pattern. If the loss due to a higher SWR is managable there is no need for emergency repairs. The same cannot be said of directive arrays whose patterns and impedance are very sensitive to changes. I never did fix the problem and frankly I can't be bothered to spend more effort on it. The antenna works and that is what matters for the few remaining months it'll be up there. The anchor for that leg is frozen to the ground (two large rocks) and there is the risk of making the problem worse by trying to untangle it from the ground. It isn't worth the trouble and risk of climbing the tower in winter weather.